The Wirehaired Pointing Griffon was developed in Netherlands in 1873, this dog breed was used for hunting and as a guard dog. This breed of dogs is very intelligent and are keen which make them a true champion of their field, this breed of dogs is not very common in United States. Wirehaired Pointing Griffon breed of dogs is medium in size and is very speedy; they are very loyal to their master and can be used as a family pet. The Wirehaired Pointing Griffon is a lively breed, they are deeply devoted and externally intelligent when they are at work. This breed of dogs builds a strong relationship with their master and can become destructive if they are left alone for long duration of time. This breed of dog does well with children and older people, they do well with other pets and small animals. This dogs breed has double coat: the outer coat is Wiry, straight, hard and gives them protection from the weather, whereas the under coat is thick and soft, the color of the coat is typically gray or silver, with roan or chestnut markings, or they may also be a solid chestnut. A distinguishing feature of this breed is the soft, thick, and bushy beard, mustache, and eyebrows. They shed little to no hair. The Wirehaired Pointing Griffon needs consistent training; training should be done with fairness and patience, they will not respond to hard and harsh methods of training. They require early socialization and obedience training. This dog breed is very energetic and speedy they need sufficient amount of exercise. They love to go for a walk and enjoy family play sessions. This breed of dogs is not suited for apartments, they are best in rural settings with a job to do. This dog breed does not require much grooming, they need to be brushed twice in a week to prevent dirt and dead hairs, and bathing should be done when needed with a mild shampoo. It is important to clean their ears weekly to avoid any infection. 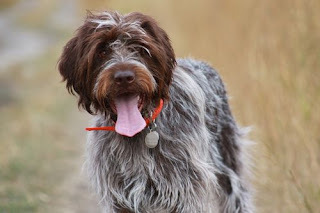 The Wirehaired Pointing Griffon has some health issues and dog diseases like. The lifespan of the Wirehaired Pointing Griffon is about 12 to 15 years. It is important as a dog owner for you to observe the health of your pet, if you notice any signs and symptoms of disease with your pet consult a veterinary at the earliest for diagnosis and treatment.